Katia was raised in an industrial port town in Siberian Russia, where her parents were both physicians and expected her to follow in their footsteps. She was an excellent student but had a rebellious spirit and longed for more freedom. She was curious about other cultures and prevailed on her parents to study languages. After becoming expertly fluent in several languages at linguistic university, she moved to Germany and experienced democracy and personal freedoms first-hand. Following her passions, she emigrated to the United States after a brief return to Russia. Art would now become her guiding focus. Katia had also studied art most of her life, though she had not been able to pursue it in Russia. She now resides on the Oregon coast, where she sees beauty all around her. 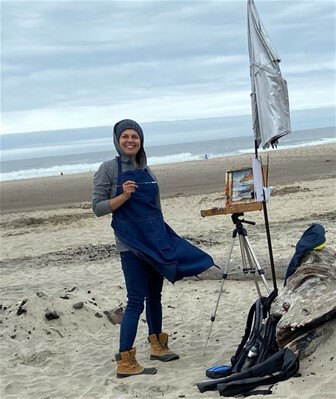 She paints images from life in an impressionistic style with traditional oils, finding beauty in a spectacular seascape or landscape or a simple (but radiant) bell pepper in her studio. Katia's work reminds us that the beauty in life is not perfect. Nonetheless, there is love, honesty and freedom all around us. We merely have to see it. In addition to her painting, she is busy raising a beautiful loving child.